Up The Creek Motorcycle Riding Group (UTCMRG) is a subset of Up The Creek Ski Recreation Club (UTC). 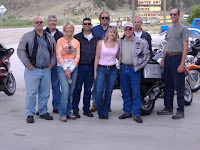 The UTCMRG was formed by several UTC members who share the love of motorcycle touring. Both groups are social organizations based in Denver, CO. The UTCMRG is free to join. You can join as a "passenger only" too. There are no rules other than, "Ride Safe" and participants must adhere to Colorado State law. The UTCMRG is composed of individuals of all ages, skill levels and motorcycle types. Everyone is welcome to join the fun and participate in all types of motorcycle touring rides along the greater Denver front range and throughout Colorado.